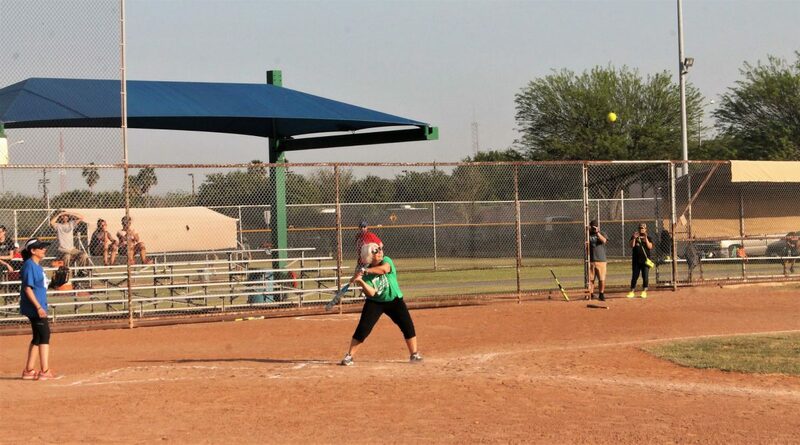 Veronica Whitacre, McAllen city commissioner, prepares to take a swing at the oncoming pitch during the Alumni and Friends Softball Game at McAllen Municipal Park on Sunday. MCALLEN– As warmer weather conditions begin to roll in, the transition in sports take place – baseball and softball are here. On Sunday, the Boys & Girls Club of McAllen held the Alumni and Friends Softball game at McAllen Municipal Park to open the youth baseball season. The Boys & Girls Club invited several officials to participate including the club staff, club alumni as well as McAllen City Commissioners and McAllen ISD school board members. The city and school officials traded their formal attire for casual wear for a friendly game of softball. It began as a brainstorming idea by Magnon two weeks ago and approximately a week of planning and notification with everyone on board at once. “We hope to make this an annual event and I think we will,” he said. The afternoon was full of laughter and enjoyment for the area children. Before each game, the players took their time to practice and did quick exercises in hopes not to strain a muscle or cause strenuous injury. Players were divided up among four teams.